The dip in U.S. market share is a hindrance to the presidentÂ’s economic goals, which the Visit U.S. coalition intends to help correct. 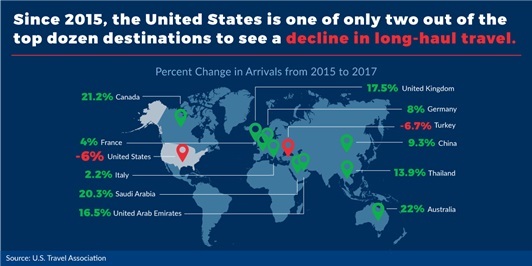 Research prepared for Visit U.S. by the U.S. Travel Association shows that while global travel volume increased 7.9 percent from 2015 to 2017, the U.S. slice of that growing pie fell from 13.6 percent to 11.9 percent in the same periodÂ—the first drop after more than a decade of consistent growth. Trade groups representing thousands of businesses and millions of jobs on Tuesday announced the official launch of the Visit U.S. 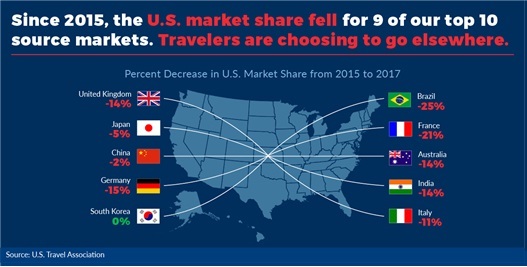 Coalition, whose aim is to partner with the Trump administration to reverse the decline in U.S. competitiveness for international travel dollars.